Lights, Camera, Automate Software Builds and Deployments! Picture this: a robust and scalable software build and deployment process minus the chaos. Follow these guidelines and best practices for building and deploying multiple applications in an integrated environment, and you might just find your happy ending. All code is not created equal. Learn from a master of the craft how to spot bad code and mold it into good. This month, Mike Clark explains how to sniff out stinky code and write comments that count. Do You Want Fries With That Test? Connect with an expert to learn how to work smarter and learn new ways to uncover more defects. 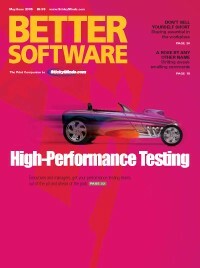 In this issue, Michael Bolton dishes out commentary on why testers who master skills instead of memorizing techniques are relished in the software industry. Turn to The Last Word, where software professionals who care about quality give you their opinions on hot topics. This month, Esther Derby explains why interpersonal skills can do more than boost your popularity; they can help you excel in the workplace. Every manager has a story to tell. Find out how one management professional tackles a fictional dilemma. The story may be made up, but the solutions are tried and true. In this installment, Johanna Rothman recounts the tale of a wayward project rescued by a cross-functional team. People who need people. It's more than just a sappy Barbra Streisand song; it's a smart way to think. Discover some techniques to increase tester/developer communication and get them working side by side on your next project. Brian Marick uses Jeremy Bentham's centuries-old punitive philosophy to explain why visibility and self-regulation can propel the success of a project. In today's software development environment, exposing bugs and its root causes for all to inspect can help teams avoid introducing the same and similar bugs into their code. Wondering how to maintain a competitive edge in this era of outsourcing and downsizing? Become an entrepreneur. Try managing your career as if it were a business, because in many ways it is. You will find your work more rewarding—and you'll increase your value to your employer. As an activity, performance testing is often misunderstood, especially by executives and managers. Try these tips on your next performance testing project and put your team on the fast track to success.